Shu-Ling Wu joined our department in Fall 2015 after teaching at the University of Hawaii, Kapiolani Community College (Hawaii), the Defense Language Institute, and West Point. 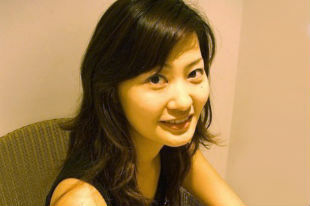 She received her Ph.D. in East Asian Languages and Literatures from the University of Hawaii in 2011. So how did you end up teaching Chinese? I decided it was something I would like to do when I was still an undergraduate in Taiwan. I like literature, but I’ve always been impressed with the practical side of linguistics: you can do work that pays off in the real world. If we better understand how people learn a language, we can find better ways of teaching them. One day I saw a poster advertising teaching Chinese as a second language—it showed a teacher helping a foreigner do calligraphy. Something about the image caught my eye. I was also interested in the English language, and British and American Culture, so I was interested both in the teaching Chinese part, and in teaching it to speakers of English. The ultimate goal is to facilitate communication between the East and the West. You studied abroad in Canada—how did that go? My year as an exchange student in Canada was really important. It was also hard! I was 20 or 21 and it was my first year abroad. While I was excited to learn so many new things, I was often overwhelmed—everything was so different. There was the language, of course, but also different ways of teaching, different expectations in the classroom. Students can underestimate the challenges of study abroad. There’s the cultural shock, first of all. And you assume your language skills will improve. But you have to put in the same effort or even more. It takes time, and you have to do the same sorts of things you’d do in the classroom—study grammar and vocabulary. You can’t spend all your time hanging out with other foreigners, speaking your native language; some students do that and they don’t improve very much at all. Study abroad is great, but you can also get many of the same things back home, if you put your mind to it; you can watch TV, listen to radio, find Chinese-speaking international students. What sorts of differences did you notice between school in Taiwan and school in Canada? Asian countries still seem to be more teacher-centered, overall, especially in higher education. Class sizes are much larger, and students don’t ask many questions. Chinese and Taiwanese students do have a very good basic education; they all know a fair amount about math, history, geography, you name it. There’s lots of pressure in high school, they spend many more hours in the classroom each year, and they do lots of studying and memorization. So they have a good knowledge base. But they are weak in terms of creative thinking, because of this educational style. And teachers who come up through this system aren’t used to addressing students’ questions. Many Asian students come to the West, especially for graduate school, because they want a more flexible approach. So would you propose that the ideal plan would be to do K-12 in a Chinese school and then come to the US or Canada for college or graduate school? Well, it’s not that simple. Each approach has its strengths and weaknesses. The Asian approach does give you a solid knowledge base for further work, but doesn’t prepare you to make free, creative use of what you know. In my own classroom I try to mix the two. My advanced training has been in the West, and I know what American students prefer. I also tend to think that the Western approach is better, on the whole. But both elements are important. So I will, for example, post readings with discussion questions ahead of time, trying to get the students to do the reading—get a basic knowledge base—but also prepare for more open-ended discussion than one would find in most Asian classrooms. My own experience studying and living abroad has been a huge help in my career. If you don’t experience another language and culture, you’ll never know the different ways that people can experience the world. In my case it meant seeing different ways to teach and learn; understanding a foreign language and culture opened up new possibilities for me, as I hope it will for my students. You’ve taught in an impressive variety of schools, the University of Hawaii, a community college in Hawaii, the Defense Language Institute, West Point, and now here in Carbondale. How has that varied experience made a difference to your teaching? Let me start with the Defense Language Institute (DLI). I would not be who I am today without my experience there. I’d seen many university students not get very far despite years of study, especially if they didn’t travel abroad. But at the DLI I saw very quick progress. They do pretty amazing training there. There’s a real emphasis on authentic materials, so while they use a textbook, they quickly go beyond that to use real materials from Chinese-speaking regions. There are small classes, with a rotating cast of teachers from different parts of the Chinese-speaking world, with different accents, and of different ages. They use an immersion style from very early on. It’s a bit like a kid learning to speak. You use language to get meaning across, even when students don’t have much to work with. Open your book, turn to page X—all in Chinese from early on. It’s a functional use of language. What have you learned about why some students succeed in language study while others struggle? Not everybody learned and retained lots of language, even at the DLI. Every student there was motivated to get ahead in his or her career, but those who only wanted to learn Chinese to get ahead often didn’t retain much. The best learners were students who were motivated and determined, but also flexible. You have to be able to tolerate ambiguity—you’re not going to understand everything you hear, or every grammatical pattern you encounter. You also have to be willing to address your own weaknesses. The best students make good use of all tools available, including technology. There are now handy phone apps that help you review words, for example; you can study Chinese during a five or ten minute break you have from whatever else you need to do. You mentioned learning about culture above. Can you give us an example of that? One good example of the importance of cultural learning occurred in 2000 or 2001. On April 1, a Chinese pilot named Wang Wei was killed in a collision between his jet and an American plane off the coast of China (“Wang Wei” on April 1--no kidding). The American plane sustained serious damage and was forced to land on the Chinese island of Hainan, where the crew were detained for a week or so before being released. During their time in China, the crew was served fish-head soup. The Americans thought they were being mistreated—they didn’t know that this was considered great food in China! Eventually they managed to get better communication going with their Chinese escorts, in part because one of the escorts was a fan of the song “Hotel California”! Shared cultural knowledge eventually helped ease the tension and diffuse what could have really ended up as a bad incident. What sort of research are you doing now, and how does it inform your teaching? I work on Second Language Acquisition (SLA), so my research is intertwined with my teaching. Just this semester, when I was teaching a course on the linguistic structure of Chinese, I realized that there’s an aspect marker in Chinese that we spent time on in the linguistics class but that is usually ignored in Chinese textbooks. I’d like to write an article that identifies this feature and suggests where it should be introduced in language textbooks. The main thing that interests me is something that takes place fairly late as people learn a second language—conceptual change. Different languages focus on different things. Some languages, like Spanish and French, assign a grammatical gender to everything. In those languages kids identify their own gender a year earlier than kids do in languages that don’t mark gender. Other studies have shown that languages that assign different genders to the same thing lead people to think about it differently. So ‘bridge’ is feminine in some languages, and people are more likely to describe bridges as graceful; in other languages the word is masculine, and people are more likely to say that bridges are sturdy. Can you give us an example of your own work in this area? Chinese has two different adverbs for ‘up’. One means “up with a destination” (more or less like “up to”). The other doesn’t have a destination—you use it if you’re just lifting something but not putting it anywhere. It’s easy to explain this to students, but they will routinely use the wrong Chinese form because they are not used to thinking this way. So how do you help students think in a new way? The first step is being aware of the need for conceptual change—this isn’t just a matter of grammar and vocabulary. You can also employ more effective teaching techniques. I’m a fan of Task-Based Language Teaching, activities that force students to use the language in a meaningful way. Otherwise the foreign language is just some bizarre code, not something real. Ultimately, frequency of use is vital to a student internalizing the new language and new concepts. Class can help, but ultimately students are responsible for their own learning. One role for the teacher is to help students understand this. What do you think about working at SIU? I like the range of programs here, particularly our programs in International Studies and in Foreign Language and International Trade (FLIT). I’m working with a student who’s on her internship for FLIT right now, in Taiwan. She’s writing a journal, and I can see the progress she’s making over time. She’s thinking about whether she really wants to be in sales! But she’s also experienced a crazy local election, and an earthquake, and she’s made lots of friends. I’m interested in research on how best to set up overseas internships and how to set specific learning objectives for students in those programs. Language is an incredibly practical tool—it helps not just for business but in science and engineering. So language is a great part to an interdisciplinary program, like ours in International Studies and FLIT, but also a great double major for pretty much anyone.